A friar of the Franciscan community of Hereford, William Herebert lectured for the Franciscan schools at Oxford, becoming the 43rd Reader in Divinity to the Friars Minor. 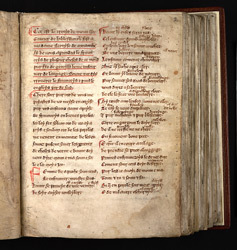 Sometime before his death in 1333, he assembled this book of miscellaneous texts in French, English and Latin. The items range from cookery and medicinal recipes (such as a remedy for a lame horse) to prayers for services, sermons and theological works. His book would have been a must-have for a travelling preacher, which was the job description of a friar. Herebert's collection begins with a manual of instruction in the French language by Walter de Bibbesworth. The heading, underscored in red, at the top identifies it as having been written at the request of 'my lady Denise de Mounchensy', who is addressed in the following preface as 'my dear sister'. The large red first letter of 'Femme' begins a dedicatory poem.